The appointment of Budi Gunawan as police chief has turned up the volume on a chorus that sings doubts about the president’s political independence. As I said in the essay, that there are only two likely explanations for his attempt to appoint a man widely suspected of corruption to head the national police: either Jokowi is bowing to the demands of the political Old Guard, or he is grossly incompetent. On the evidence of this interview given on his 98th day at the helm (which I had not seen when I wrote the Nikkei essay) I would have to agree with Daniel Ziv that the Indonesian president is not currently in charge of his own faculties, let alone the country. 1 Comment on "Jokowi needs to learn the difference between popular and populist"
Hi Elizabeth, I’m reading “Indonesia, Etc” right now and enjoying it immensely. The Jokowi interview you embedded here really is painful to watch. Initially I thought that he was on something. But from the way he very carefully hewed to the select words/phrases, I think he was just very uncomfortable in this limitation (or had to take something to get through it…). I admit to having been caught in Jokowimania before the election (from the safe distance of the US), and very much relishing the Prabowo vs Jokowi spats on my friends’ Facebook pages. 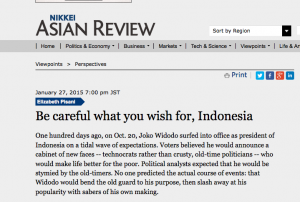 And then, I happened to be in Jakarta during the Gunawan debacle, and was quite disillusioned by it. I think your former explanation makes the most sense, that Jokowi must keep the Old Guard happy to preserve his fragile hold on power. I suppose I can understand people’s preference for decisiveness and forcefulness, but those traits are usually coupled with an unshakeable sense of never being wrong (see: Bush, George W.). So my rule of thumb is that candidates who delight in showing their decisiveness and forcefulness make bad statespersons. Anyway, I look forward to reading more of your posts and books!